Sandra Gibson and Luis Recoder, Light Spill, 2005, modified 16-mm projector, film, screen, dimensions variable. This is the first West Coast solo exhibition for Sandra Gibson and Luis Recoder, whose work explores the materiality of cinema and the meaning of analog in the digital age. In Light Spill, 2005, a 16-mm film is projected onto a portable screen, but the image appears as an illegible smear due to the removal of essential parts of the projector. Our eye is drawn instead to the movement of the film itself unspooling into a large pile on the floor. Hundreds of metal film canisters line the wall nearby like castoffs awaiting their turn to unravel. 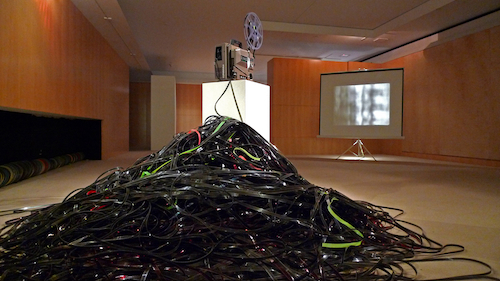 Threadbare, 2013, a 16-mm projector wrapped in celluloid, feels like an open-casket display of the cinematic apparatus. If filmic material appears as waste here, light becomes the resurrecting force. In Transparency, 2013, a projector’s casing has been stripped away to reveal its whirring machinery. Framed by two pieces of rippled glass, light spills out the side of the machine and through the glass to create striking serpentine white and pink bands on the nearby wall––the rosy hue created by the bulb’s temperature. Elsewhere, Reflexion, 2016, sculpts a complex, immersive space out of light and shadow with a projector and a large mirror. While artists and theorists have been exploring the so-called death of cinema since the 1990s, Gibson and Recoder’s work is predicated on a deep, gearhead-level engagement with film technology and history that is frequently lacking in art contending with cinema more superficially. Their practice, which also includes the stunning piece Dark Chamber Disclosure, 2011, performed live on two projectors at REDCAT just over a week before this show’s opening, refuses nostalgia and gets under the hood of old technology to rewire it for the contemporary moment.